Needle and Thread by Hadas Ilani, a student of Industrial Design at the Bezalel Academy. The project was born while contemplating local material, the kind that is always around us and is embedded in our childhood memories. 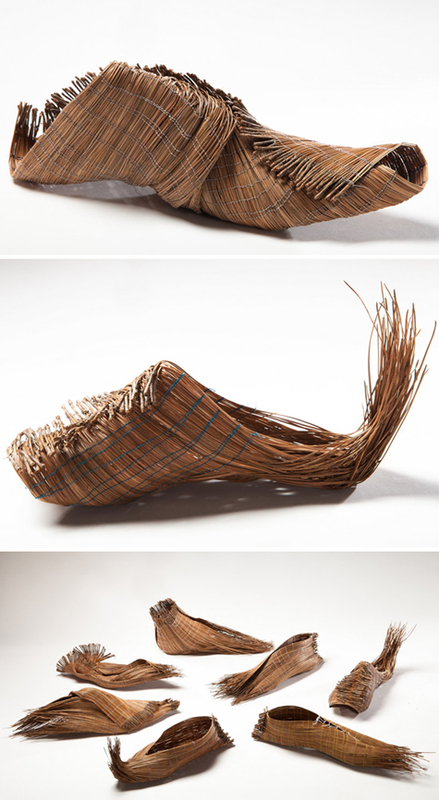 Hadas examined various methods of sewing pine needles into shoes, and created a collection of 14 pairs of shoes, which explore the possibilities of using pine needles as raw material, which allude to the gentle needle mat, and the previous lives of the needles. Phenomenal technique and detail. I love the gesture of the shoe resulting from the unfinished edges. It reminds me of some of the indigenous shoes I saw at the Bata Shoe Museum.